Today is the day of gratitude, nationally. We could use more of these. But Im grateful for this one. ° the chance to meet hundreds and hundreds of you, in five different cities. You were once anonymous readers and are now indelible faces in my mind. Thank you for buying the book, for emailing me your kindness, for showing up in cupcake shops and swanky wine bars, bookstores and farmers markets. This time I will never forget. ° the dear friends who let us stay on their couches and helped us schlep our stuff up stairs and hailed us cabs. Cindy, Gabe, and Tea  you are amazing. ° Sharon, who flew into New York City from LA, just to celebrate the publication of the book. Sweetie, Ive known you since I was fifteen, and you just keep getting better and better. ° the grand folks at Wiley, who published a beautiful book, and held my hand through the process, even when I occasionally grew petrified that no one would buy it. ° the chicken and rooster from down the street, who stand beneath our bedroom window every morning about 10 and crow and shuffle until we open the back door and throw them feed. ° Elliott, who continues to delight me with every nephew daring do he performs. This year, he fell in love with the Rescue heroes, and learned to climb the wall outside (or pretend). He is irascible and hilarious, and he makes me happy every time I see him. ° the potato man, from Olsen Farms, whom I know has a name. But the Chef and I call him The Potato Man every time we see him at the farmers market, and we smile that he is in the world. ° the splash of purple flowers hanging over a wooden fence as I drove through the Arboretum in the middle of November. ° five fierce, amazing women at SuzukiChou Communimedia, who feed us with sarcastic comments about people who don’t get it and enliven us with their unquestioning belief in the yes, every time. Oh, and they set up some damned fine events. ° every one of the dear ones who came to our wedding, surrounding us with love in our own backyard. And the infinite patience of most of them (oh, one hopes!) with the absence of thank you cards, still. We have been a little busy, but still. ° Pat and Hubert, for driving us around Umbria, with Emma trilling her soothing tones from the GPS. (Recalculating.) Without you, we would have been lost, stuck in that small apartment, and walking down that scary hill alone, every morning. We bless the day you decided to go to Brigolante. ° the little boy in Black Oak Books in Berkeley. We were loitering, waiting to meet our friend Shuna for dinner. Tea had just asked if they had a copy of my book. They didnt. They couldnt even order it. (Go into your local bookstore and ask them to order the book!) I felt a bit disheartened. From out of the back came this five-year-old, in a tie-dyed t-shirt, hopscotch skipping across the linoleum floor. And as he skipped, he chanted, loudly, Mr. Potato Head, I love you! Mr. Potato Head, I love you! My mood switched. We have been repeating it ever since. ° the taste of French feta, ripe avocado, and sliced fennel with lemon juice. ° the fact that I write whatever feels urgent onto this blank screen, and people all over the world are reading. For you. ° living every day with the knowledge that I have to live gluten-free. Its food that has healed me. What a dazzling life. ° my family, who put up with me, and still teach me, every day. ° the Chef. Oh love, all I do is exude gratitude for you. It makes sense that we celebrate the holiday of gratitude in late November. We need the reminder. This is one of the darkest months of the year. The sun is setting close to 4:30 here in Seattle, the horizon a tiny slice of electric yellow against the darkness pounding down. Oh Seattle, I love you, but these winter days are short. Times like these call for pudding. Ive actually been pretty sick the past week, fighting off a pernicious infection that swarmed my system and left me pinned to the bed. With all that time in planes, smiling at everyone I met, and sleeping in strange beds nearly every day of the week, my body just shouted at me, Slow down! The last post I put up, about Thanksgiving? I wrote it in bed, the laptop propped up on my knees. And between nearly every paragraph, I set aside the computer and fell into a soft nap. The day I knew the antibiotics were doing their work? When I flipped through the issue of Gourmet that arrived in the mail that day, and I wanted to make every recipe. The itch in my fingers to fiddle in the kitchen started up again. I have missed it, being in the kitchen. Music on, the smells simmering in me, dishes going from idea to chew  this is what I love. As much as being on the road made me happy, for the chance to meet you, I missed our home. So I marked up the magazine, ripped out recipes immediately, and started dreaming of how to adapt the baked goods to gluten-free goodness. And then I began at the beginning of the magazine again, and found this new technique for rice pudding. Simple as black numbers on a white clock face, this recipe takes about three minutes of preparation. I bounced out to the kitchen and found I had every ingredient in our cupboards. Stirring and pouring, I had pudding ready to bake in just enough time to lie down on the bed again. This pudding tastes like comfort to me. True. So I cut back. But if you love the sweet heat of cinnamon wafting to your nose, feel free to add more to this, if you wish. Preheating the oven. Go ahead and turn on that oven to 350°. Preparing the pudding. Gather four ramekins. Grease them generously, with either butter or your favorite non-dairy substitute. Pour ½ cup of the rice milk into each one. 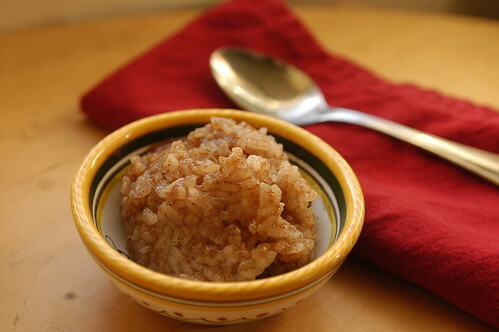 Spoon in 5 teaspoons of the rice, 2 teaspoons of sugar, and the cinnamon into each one. Stir. Finishing the pudding. Cool the puddings for at least one hour on your countertops before eating them. There will probably be a little skin on the top of each pudding (less so with rice milk than cows milk, however). Pull it off gently, relishing the sensory experience. Eat the pudding. Better yet, pull the skins from the puddings and let them cool in the refrigerator for at least an hour more. (They are definitely better overnight.) Now eat the pudding. At this time of year we have an art show just about every weekend. And usually we (my family) all get sick. A couple of years ago we started eating raw garlic in the morning…and presto…we get through our busy crunch season without dire illness. So when the days become short and the nights long we get out the organic garlic (garlic that we barter artwork for when we are at the Garlic Festival in Saugerties, NY) and wipe off the garlic press. What sweet sentiments for a happy day of family and love. 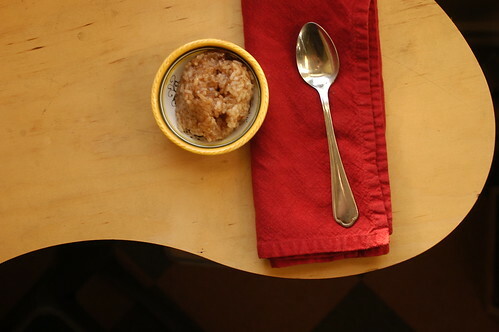 And…hello, sweet, sweet rice pudding! One of my favorite treats. I am with you on taking time more than once a year to express our gratitude for the many blessings we enjoy! I am so exited to try out the rice pudding receipe; but am wondering if I shouldn’t add water to the baking pan with the ramekins before I slide it into the oven? I live in Edinburgh and bought your book on a visit to LA in October. I hope to buy at least one more copy on my return visit at Xmas as I have already given the first copy away, always a sign of a good book don’t you think? Just hoped to cheer you up a little bit about book sales. Though singing about loving Mr Potato Head is obviously a better way to make you happy. Thanks for the lovely stories, recipes and sentiments. This is a pudding that a true slacker would love! SO easy. And, I love cinnamon…the more the merrier. I sprinkle it liberally on my daily cappucino. This one has to go on my to try recipe post, and this would be a good one to make with children. I’m a girl from sweden that’s a gluten intolerant. BTW, There is good alternatives here today for me. Every year there’s this.. “convention” thingy where you go and there’s all kinds of brands that produces glutenfree food. It was one TODAY actually and we bought SOOOO many stuff! many kinds of bread, cookies and other stuff. Another thanks for stopping by… and your pudding looks wonderful! The potato guy with the big, bushy beard? That’s Brent. Brent Olsen. I love Rice Pudding, especially for breakfast. I always add some dried fruit to mine. !!! One of my favorite things to make for my 2 1/2 year old Celiac son – he just about begs for it on cold winter mornings here in VT. My recipe is a bit different – I parcook the rice in a bit of water, then add vanilla soy milk to finish it before the sugar & cinnamon, but the ingredient combination is delicious pretty much however you make it. I think my son might actually like cinnamon as much as you – one of his biggest toddler do-it-yourself joys is to vigorously shake what seriously looks like 1/4 cup of it into his bowl when I make it for him before he wolfs it down. Like you and the Chef, G and I have so much to be grateful for in this first wonderful year of our marriage. And we express it often, especially to each other. I’m thankful for you, too. I’ve started doing some cooking for a family that’s vegetarian as well as dairy and gluten-free (http://fingerineverypie.typepad.com/my_weblog/2007/11/id-call-that-a-.html), and your blog, which has always been a wonderful resource to me, is more important than ever. Thanks for being here! Among the things I am thankful for this year: your blog, which inspires me both to eat and write well. Thank you. Oh, and rice pudding too. The smell of cinnamon keeps me warm all winter. She cooked the rice in coconut milk and water (1 rice: 1 coconut milk: 1 water), with a stalk of lemongrass thrown in. She stirred it a few times during cooking to make it creamy, then added brown sugar, chopped dried apricots, and dried cranberries. Finally, she added a bit of soy milk to get the right pudding composition (water or milk would work too, she says). It was easy, and really tasty! I’m still learning about gluten free diets–does this qualify? your blog is absolutely amazing! it gets me through so many different times, whether it's struggling to find a recipe that satiates my desire for the gluten-free version of things i used to eat, or simply drinking up your words of realness and light. and now for my question: are you putting the rice into the ramekins uncooked or parcooked or cooked? thanks! I made this today, and it was great! I thought I’d let you know about a substitution I made in sweeteners: instead of 8 teaspoons of sugar, I used 5 teaspoons of agave nectar. Also, instead of sweetening each ramekin individually, I dissolved the agave into the rice milk and then ladled out the milk. To dissolve the agave well, I put 5 teaspoons of agave and 1/3 cup of rice milk in a bowl. I microwaved the bowl for 1 minute and then whisked the warm milk and agave together. To this bowl I added the rest of the milk (1- 2/3 cup) and stirred it a couple of times so all the milk was sweetened.